Sorry I’ve been completely absent this past month. I didn’t mean to neglect Oh My! Sugar High but unfortunately my other blog was taking most of my attention with a fun event I was running. But now I’m back and can’t wait to share some more recipe with you! For now I’ll wet your whistle with this sweet Lemonade Salad. It was the perfect touch for my dad’s luau birthday party last weekend! (Watch for more information about the cake I made which will be coming soon!) You can choose to garnish it with oranges and cherries or simply sprinkle some of the yummy crust crumbs on top as you serve. Either way, this salad is light and refreshing and perfect for your next summer cookout or picnic! Although it may not seem like the most diet-friendly dessert, you can also make it a little less damaging to your diet by sprinkling on some Sensa, a great weight loss product that can be used on anything from garden salad to treats like this one! 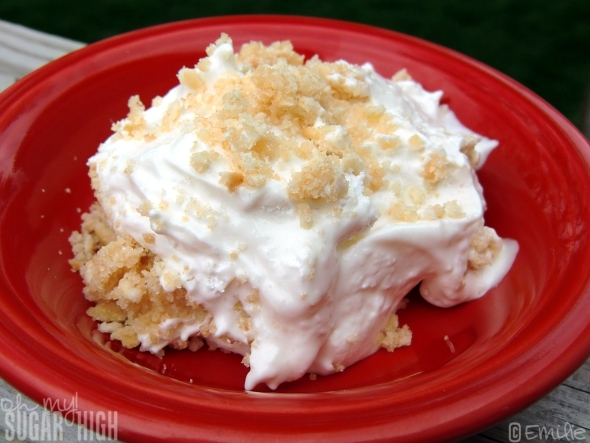 Mix together cracker crumbs, melted butter and and sugar before pressing mixture into ungreased 13″ x 9″ baking dish. Set aside. In a bowl, combine milk and lemonade concentrate until smooth and mixture starts to thicken. Fold in whipped topping then pour mixture over crust. Cover and refrigerate for 3-4 hours. Garnish with oranges and cherries by arranging oranges in flower shape and using cherries for the center if desired. This recipe was originally published in Country Woman magazine in the May/June 1998 edition. You can also find this recipe at Taste of Home.com *This is a sponsored post. « Lemon Drop Cookies – Tea Anyone? I love lemon-flavored anything for the summer! It’s such a refreshing taste. This recipe does make a great addition to a cook being that it’s easy to put together. Would have to try it with strawberry or blueberry garnishes too. Thanks for the recipe! After seeing the picture and looking at the ingredients, I have to make this! Looks super YUMMY! Do you use pink or regular lemonade? or does it matter? I want to make it for our YMCA potluck? Nope, it does not matter and tastes yummy either way! Have fun at your potluck! Wow this sounds amazing. I just took out frozen lemonade!